I live about 14km from the office and travel to work by car every day. I wouldn’t dream of setting off on foot each morning to walk or run to work. 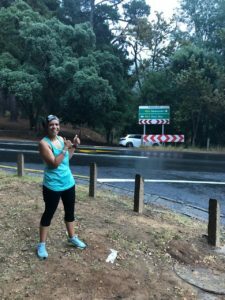 Yet, on Saturday April 20, I’m going to join thousands of other runners who will cover one-and-a-half times that distance as they tackle the Old Mutual Two Oceans Half Marathon. And of course there are those who will be hitting the road with the goal of covering four times that distance (56km) in the ultra marathon which marks its 50th running this year. As a novice runner, I’m leaving nothing to chance – and in addition to physical training, I’m also filling up on knowledge about nutrition, strength training and the importance of rest, which I’ll be covering in a series of blog posts. An integral part of my preparation is the structured, scientifically formulated OptiFit training programme run by the Sports Science Institute of South Africa (SSISA). The nine-week programme includes not only three days of running every week – with a long run on the weekend – but also specific days dedicated to strength training, cross training and rest. SSISA’s Kathy McQuaide, who has years of running experience and acquired knowledge, says it’s important to focus on a gradual progression in one’s training, balanced nutrition and factoring in adequate rest and recovery. And I’m guessing that anyone who has taken on a major challenge, will understand the point I’m going to make next – achieving one’s goal requires not only physical strength, but significant mental investment as well. Former American President Franklin D Roosevelt advised that: “When you come to the end of your rope, tie a knot and hang on”. They also suggest coming up with mantras you can repeat to yourself if you start to struggle, or to think about the solid training and ample preparation you put in ahead of the race. Here I am at the top of Southern Cross Drive, one of the steep climbs along the Two Oceans route. Kathy adds that it helps to know the race route and to “test drive” your kit. “When doing your long runs – use them as practice for the race. Start at the time you will start OMTOM 21.1km. Eat or drink what you plan to have before the race – and even wear your gear to get used to the fit and to see if you chafe,” she says. And on that note… What you wear on race day has the potential to impact on your performance – and enjoyment of the race – so make sure that you’re comfortable. I’ve had terrible experiences with poorly manufactured tights that seem to fit, but sag when I start running – and you really don’t want to be tugging at your pants every few seconds to keep them from falling off. I also won’t compromise when it comes to sports bras. Getting one that fits well and provides the required support can have a big impact (excuse the pun) on your running experience. If you run with your phone, think about where you’re going to keep it. I’ve tried arm bands and running belts, but find that tights with a phone pocket are my preference. “There are all sorts of items runners can use but really the most important are shoes,” adds podiatrist Chris Delpierre. Asked about the assessments he does with runners, Chris says, “A running podiatry consultation will deal with several issues, trying to find the optimum set-up for each runner based on their foot shape and running biomechanics. “We would look out for hip, knee and foot positions during the running cycle to try and assess where injuries are likely to occur and what can be done to prevent them.